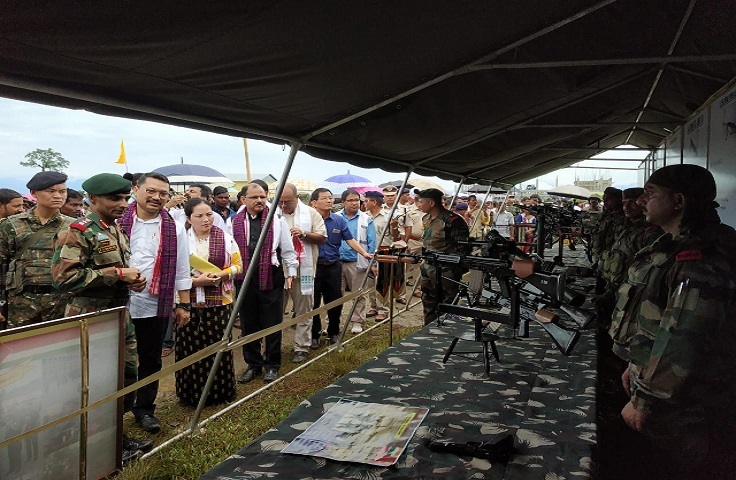 Chowkham Battalion under Lohit Brigade, Dao Division participated in Independence Day celebration at District Headquarter, Namsai in Arunachal Pradesh on Wednesday, a press release by PRO (Defence) of the Indian Army stated. The Battalion’s pipe band put up splendid performance in the function which was attended by various dignitaries and cross sections of people. Among those present were local MLA Chau Zingnu, Deputy Commissioner RK Sharma, DIG Mari Riba and Col Nalawade. The function was followed by a weapon and equipment display for the public under “Know your Army” campaign. Aimed at inculcating a sense of pride and motivating youth to join the Army, the event received lot of applause, which was evident from the fact that many parents enquired about how their wards could join the Army. Many students were briefed on the subject too. The event was followed by distribution of pamphlets, posters and brochures on the subject.